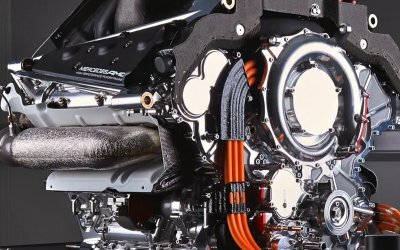 At the most recent meeting of the engine working group last Tuesday it emerged that constructors are looking for an engine formula that will provide simpler and lighter engines, following a considerable weight increase since the introduction of the Hybrid power units in 2014. But why specify a limit that is practically unattainable? Why is an engine airbox design arms race more interesting to anyone than an engine design arms race? It doesn't just work like that, you can't just set a rpm limit and a fuel flow limit on a naturally aspirated engine. First of all the current formula works because you can both control airflow and fuel flow very precisely. You can't control airflow very precisely on a naturally aspirated engine. Didn't they do precisely that from 2008-2013? The formula you created there would be way too rich in AFR. A 2 liter engine at 14.000 rpm consumes 14.000 liters of air per minute, at volumetric efficiency of 100%. 14.000 liters of air weighs about 18.1 kilogrammes at atmospheric pressure. It's harder to run excessively lean without forced induction. So the air fuel ratio would be 18.1kg of air divided by 2.33kg of fuel which equals 7.8 and that's too rich. And remember that the volumetric efficiency and air density are variables, variables you can offset by using a turbo, but not in a NA engine. You're still limited by the fuel supply, so you can turn up the power but you won't make it to the end, unless of course the teams develop the heads and increase efficiency. And no, you wouldnt be limited by the fuel supply but the air supply at 14K rpm with 140kg/h of fuel. What air fuel ratios do you tune for in NA cars? I go for 11.7-12.2, some high strung NA cars I'll go as rich as 10.8. But yeah 140kg flow rate is probably too much, sorry to have triggered you with a 20kg/hr overestimation. I suspect that if we knew the true calibration of O2 sensors we would get a shock. I only tune with wideband 02, if my customers don't have one I tell them to get one and get back to me. Close enough for the $6,000 turbo kits I usually tune. The unlimited budget folks can afford better sensors, those folks are by far the minority. The FIA also presented the latest version of its 2021 power unit regulations, noting only that the engine would be a 1.6-litre V6 turbo hybrid, with no MGU-H. This format was first outlined, with much more detail, on October 31 last year. Although the decision to abandon the MGU-H shows that Liberty has not compromised on its stance about the energy recovery system, other elements of the 2021 package remain the subject of debate. Sources have indicated that the FIA and Liberty have different views on some aspects of the final concept. If they are going to dump the MGU-H I'd like to see them go with unlimited energy recovery from the turbo (just a GU-H) with a much stronger MGU-K setup. Keep the total horsepower about the same. I know F1 isn't about standardization but I think (if they want more engine suppliers) they would need to do a standard hybrid setup. Not ideal, but a way to help control costs and entice more suppliers. As far as turbo setups I have always used cheap, fast, and reliable. You get to Pick 2. As my rule of thumb. I went fast and reliable. The longer i think of it, the more i am convinced that the 4 current manufacturers will not run without a some form of exhaust heat recovery. Most part of developed technology around lean-combustion will become useless if you cannot recover it from the exhaust. Even Honda seems to got it sorted, they are not going to dump it after 2 years. Let's hope they keep it. The knock on effect of dropping the H is enormous. 'Cost savings! ', they cry. How changing platforms a year after everyone has perfected the current unit can cut costs is beyond me..? They should freeze the ICE and open up the ERS a bit more. Perhaps a larger K and 8MJ deployment?